The governor of Ukraine’s Dnepropetrovsk region, Igor Kolomoysky, claims he has helped secure the Kiev HQ of the national oil and gas extracting company “from raiders”. It comes days after he tried to regain control of an oil transportation company. “The Ukrnafta building on Nesterovskoye Lane is being barricaded with metal barriers,” Ukraine MP Sergey Leschenko wrote on his Facebook page. “On the street there are two members of an unknown battalion. Inside, through darkened windows, another ten fighters of an unknown battalion are visible. The guards refuse to show their permit for the new fence,” Leschenko noted. Deputy chairman of Ukrnafta, Victor Zakharov, announced that there was no emergency situation and that the gunmen had been deployed to guard the HQ while workers were erecting metal fencing – all to prevent a “possible raid”. He added that the armed group was a “security contractor,” refusing to specify its name. Later Kolomoysky personally confirmed the event was a “routine anti-raider activity.” He also promised to contact the prosecutor’s office, once journalists reminded him of the legal method by which to handle expectations of an imminent raid. “Kolomoysky is challenging [President] Poroshenko,” Leschenko assumed. Earlier the same day, the board of Ukrtransnafta relieved Kolomoysky’s protégé Aleksandr Lazorko of his post and appointed Yuri Miroshnik as CEO. Lazorko refused to leave his post, protesting the decision, and barricaded himself in the office until Kolomoysky and his men entered the office and took it by force calling Lazorko’s resignation a corporate raid. 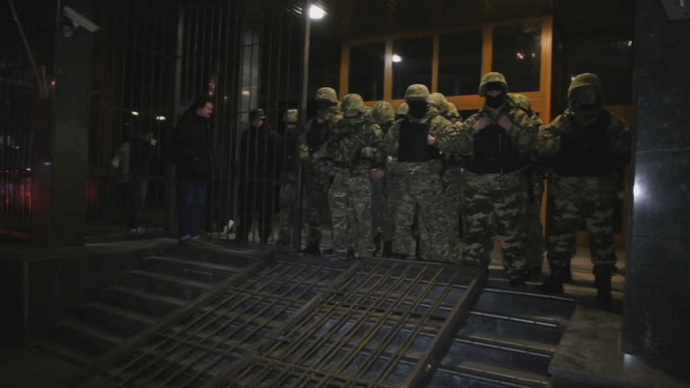 Later in the evening Interior Minister Arsen Avakov reported the building was under control of the police. On Saturday, Ukrainian media reported that Kolomoysky’s Privatbank had blocked Poroshenko’s account of $50 million. However, bank officials say that it was just a glitch. Ukrnafta is the biggest oil company of the country which deals with over 86 percent of Ukraine's oil production, 28 percent of gas condensate production and 16 percent of gas production. The controlling stake of the company belongs to the state-owned Naftogaz company, while 42 percent of shares belong to Igor Kolomoysky. According to Leschenko, this is the first moment in Ukrnafta’s history when government management in the company can be established. Kolomoysky is one of the richest men in Ukraine with an estimated wealth of up to $6 billion. According to Forbes his net worth is $3bn. Some of his wealth is rumored to have emerged from numerous hostile takeovers of his competitors. Amid last year’s coup and the turmoil surrounding it Kolomoysky used his wealth to secure political power. Then-acting President Aleksandr Turchynov appointed him as a governor of Dnepropetrovsk region. The oligarch used his newly gained powers to stem the so-called “Russian influence” in his area. Kolomoysky also is believed to have created the ultra-nationalist Dnipro Battalion. Basically forming his own personal army, Kolomoysky also funded the Aidar, Azov, Dnepr 1, Dnepr 2, and Donbas volunteer battalions, which were accused of carrying out mass atrocities. In Russia the oligarch is sought for “organizing the killing of civilians,” as last summer a Russian District Court authorized his arrest in absentia.